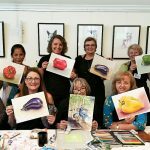 Learn more about art classes or book online in the online shop. For FAQ see below. Come join our beginner classes! Perfect for anyone wanting to build confidence drawing or painting — even if you’ve never picked up a pencil or brush before. 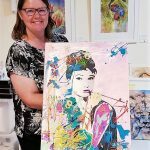 Saturday Paint Away Workshops — these suit painters of all levels as the artwork creation is guided step by step, with lots of learning along the way. Come join our more advanced classes! Suits anyone who has completed our Beginner classes or has experience and confidence painting and drawing. 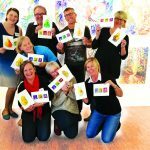 Guided Painting Masterclasses in mixed media. 5 week blocks, covering all sorts of mediums and subjects. Learn to paint faces, beachscapes, florals, figures, and more. How do These Classes Work? Have you always wanted to learn to paint? Perhaps you have been disappointed with your art teachers in the past… It’s very different here. Come in and enjoy one of the painting classes in our lovely studio for people of all abilities, even if you’ve never picked up a paintbrush before. You will come away feeling confident at last, really understanding the materials to use in that medium. 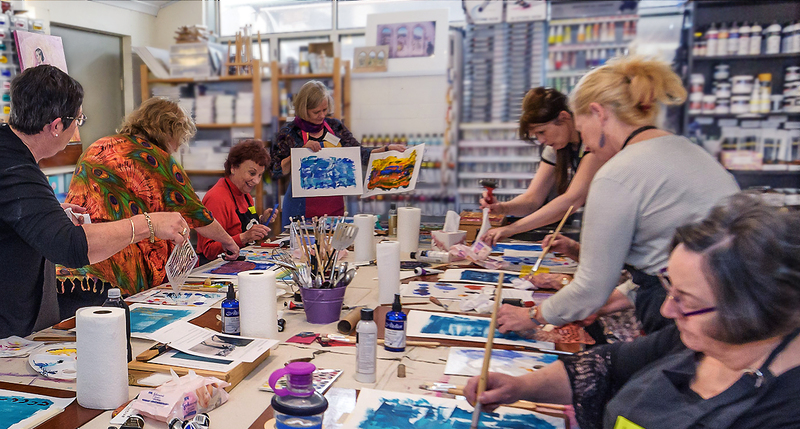 Whether it’s oil, watercolour, acrylic, pastel or mixed media, we have fun classes filled with laughter and learning. 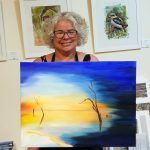 I love teaching and if you’re ready to learn from a teacher who explains things in Plain English so you really understand, you’ll be empowered to paint more, and create more beautiful artworks than you could have possibly imagined! All materials are included in the class fees. There is no materials list you need to go out and pay for before the class starts, it’s all provided. We use only the best quality materials in the classroom. In most art classes, it’s usually a matter of watching an artist do a demonstration, then you being thrown in the deep end to try and struggle through for yourself, with the artist coming along and fixing up your mistakes. That way, you always need to go back to the same teacher again to keep struggling on, because you are not really understanding. We believe that’s not really teaching! Our classes are very different. I have broken down all the learning into a structured course of steps. In this way you experience all the different aspects of each medium yourself, by discovering it with the brush in your hand, painting exercises and creating finished paintings. I explain really clearly in plain English why things happen with the paint, and how to create beautiful paintings, step by step. You receive handouts of notes as memory joggers for later on. You will create paintings all by yourself in our classes because you really understand how it all works. Each lesson builds on the previous lesson’s knowledge and experience. You will be Amazed at What You Can Do! You will come away with the most amazing paintings that you have created all by yourself. 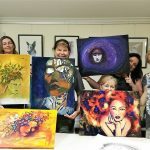 You will even be able to go and create your own artworks after the class without a teacher helping you every step of the way, because you will understand how it all works. Most people are amazed at what they learn in these classes. You might even learn a thing or two about your little self in the process. You will find the classroom a positive, safe non-judgmental environment. Everyone enjoys quite a Zen approach to learning here at the studio. I hope you come and join us for fun and laughter and learning! Learn more about art classes or book online in the online shop. I need to skip a class – can I make it up later? Unfortunately we are not able to accommodate any make-up classes. Just like when you buy airline tickets or theatre tickets, refunds are not available if you don’t show up. Please understand that we cannot refund or transfer any bookings once the class has been scheduled. Once we have firm bookings, we are already ordering and paying for materials for that class, and the teacher’s time is booked in for that period of time. It turns out I can’t attend the whole course – can I send someone else in my place? Yes, usually this is fine. You can transfer your booking to another person if you have not yet started the course and it is a class that does not depend on a previous course (such as a Level 2 course that requires Level 1 attendance). You must let us know the full contact details of the other person (phone, email, address) at least 24 hours prior to the class starting. This happens rarely. It could be due to numbers or the teacher being unwell. If this happens, you have the options of leaving any money paid on your accound as credit towards furture classes or artworks, booking into another class, or a refund. Most people opt for another class because they are all fun to do! I’ve never picked up a brush in my life before – will I be OK? YES! We cater for absolute beginners. Most of the people in the class will be in the same boat. 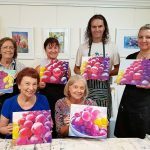 You will find these classes very gentle and kind on people who are completely new to painting. You will be amazed at what you will learn in a supportive and positive learning environment. I have a child I’d like you to teach. Can you do this? All of our classes in our calendar are designed for adults. Usually I don’t teach kids just due to lack of time in between these adult classes and all of my painting commissions. There are a few other places that you can go that specialise in children’s classes. But I have taken on some special cases along the way. If your child is young (such as under 12 years old) and if they are showing some real talent then there are still some other questions to ask. Do they have a real passion for it? Most importantly is your child wanting (for themselves, not for you) and willing to come along to learn from a full time professional artist? If so, then I may be able to make an exception, and provide a special one-on-one class where they can really learn some good skills and techniques. My teaching builds the ability to see what is truly there, so I can guarantee that their drawings (and/or paintings) would improve out of sight, and they will learn skills they can use for a lifetime. My personal tuition rates are $165 for the first hour, then $132 for each following hour at the studio here. A two hour session is recommended to gain meaningful learning. This price is the same if you wanted to join in the session and have some fun with them while they are learning – if this is appropriate. For very young children we would require initially that you are at least present in the building while they are learning. You could try out a session to see what you think and then consider doing a 5 week block after that. If they enjoy it, and they show some skills and their age and personality was suitable then later on they may be able to join one of our adults’ courses which are a lot more affordable, being in a classroom situation. Give me a call if you have any questions on 07 3202 9991.